Mostafa obtained his Bachelor of Science from Cairo University’s School of Commerce in 1986. He joined the firm in 1988, and he has assisted in both the patent and trademark departments before specialising in patent registration. He is a partner and a prominent member of our patent and industrial design team. He helps clients secure their intellectual property rights internationally and domestically in a punctual manner. Cooperating closely with our IP department, Mostafa assisted in the development of several applications that modernise and simplify the annuities payments and processing for patents. 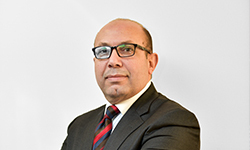 Mostafa mainly handles prosecutions, oppositions, filings at the Patent Office, and appearing before the Patent Office to secure the client’s best interest. Mostafa is a member of the Egyptian Patent and Trademark Association, Egyptian Association for Protection of Industrial Property (AEPPI), International Trademark Association (INTA), and the Arab Society for Intellectual Property (ASPIP).